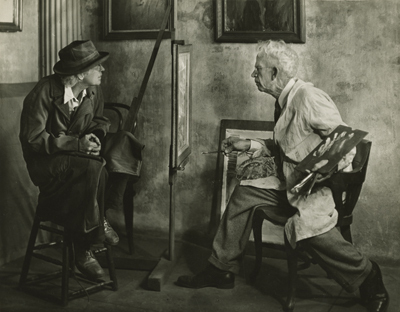 “Pops” Whitesell photographed himself while having his portrait painted by an artist thought to be Alexander Drysdale|! !| circa 1929. My mother worked for Pops Whitesell in the 1920s at the Preservation Hall location in the French Quarter. He was a photographer. Can you tell me anything about him and his work? Joseph Woodson “Pops” Whitesell (1876-1958) was born an Indiana farm boy. A self-taught photographer who built his own cameras and photographic apparatus, Whitesell started shooting pictures in his late teens but it was decades later before he settled in New Orleans. In his early 40s, Whitesell rented an apartment and studio at 726 St. Peter St., which later became Preservation Hall. Especially adept at Rembrandt lighting, which mixed natural artificial light for dramatic artistic effect, Whitesell was, in the 1940s, ranked as one of the world’s top salon photographers. In ’46, the 70-year old photographer had a 58-photograph one-man show at the Smithsonian Institution. Authors Sherwood Anderson, Sinclair Lewis, Earl Stanley Gardner, WPA writer Lyle Saxon and assorted Carnival royalty were among Whitesell’s photographic subjects. Gardner, a close personal friend and creator of Perry Mason, used Whitesell as inspiration for the character Gramps Wiggins who figured prominently in Gardner’s mystery novels The Case of the Turning Tide (1941) and The Case of the Smoking Chimney (1943). A small man who weighed little more than 100 pounds, Whitesell became increasingly frail in the last five years of his life. Never caring a great deal about money, he spent his last years in poverty. Months before his death, friends sold his remaining prints in an effort to raise funds to cover his personal needs. Whitesell died Feb. 18, 1958, and was laid to rest in Terre Haute, Ind. In ’78, approximately 2,400 Whitesell negatives, mostly portraiture, were donated to Tulane University. I recently came across an article in which you allude to a certain photographer, a James Henry Scoggins, who worked out of two or more studios in New Orleans from about 1850 to when he died (March 29, 1904). Your reference to him was in response to a question from a Jeffrey Murray in August of 2010 regarding a photograph taken of a militiaman in New Orleans. James, of course, was the photographer. He is also my great-great grandfather about whom I’ve been striving somewhat desperately to find more information about. My direct line goes through Effie R., daughter of his second wife, Mary T. Jackson. I know his birth, death date and that he was a photographer, but know very little about his life or that of his family other than what’s given in vital records and the census; nor do I have any photographs of him – which I’m trying to find. I have researched photographers in the area but wasn’t able to find his name tied to anything – until now, thanks to you. Could you tell me anything more about him? Where might I go to perhaps find more of his photos; perhaps even find pictures of he and his family? In the late 1860s and early ’70s, city directories show another Scoggins working as a Poydras Street photographer. Thomas R. Scoggins, perhaps a brother, briefly worked in James Henry Scoggins’ studio but neither the 1870 nor the ’80 federal census clarify his relationship to James. Scattered examples of James Henry Scoggins’ work occasionally show up at places such as The Historic New Orleans Collection, which has two pictures by Scoggins. Unfortunately, they have no further information on this New Orleans-based photographer or his unidentified subjects. When I was growing up in New Orleans, there was a wonderful New York-style pizza restaurant on North Rampart Street: Gibby’s Pizza. Saturday nights there were quite entertaining with Gibby tossing pizzas and the food was always great. Whatever happened to Gibby and his restaurant? From 1956 through the ’70s, Gibby’s Pizza House operated at 616 N. Rampart St. Its name was somewhat of a misnomer since the place also served steaks, seafood, chicken and salads. The site later became another popular local Italian eatery, Mama Rosa’s Slice of Italy. I’m absolutely intrigued with the LaGarde Hospital and lakefront area history. I noticed in old photographs of those areas there appears to be a large 10-ring drive-in movie theater located at what looks like Canal and perhaps Robert E. Lee boulevards. If so, would it now be Peridot Park? Can you provide insight as to when the drive-in was built, what it was called, who owned it, who were the patrons, when it was removed and insight regarding other drive-in theaters in the lakefront to City Park areas? You are absolutely right. The Drive-In Theatre was only around a brief time but it was located on Canal Boulevard, about a block lakeside of Robert E. Lee Boulevard. Comparing old aerial photographs with modern satellite views of the area, I would place the theater on Canal Boulevard near Jewel and Sardonyx streets. It was clearly not located at the site of Peridot Park, which is a tiny park at the intersection of Robert E. Lee Boulevard and Canal Boulevard. The Drive-In Theatre seems to have operated from 1940 until about ’44. It didn’t survive World War II. The Drive-In Theatre opened for business on Tues., May 28, 1940. It was operated by Modern Theatres, a recently incorporated Louisiana company headed by Charles K. Woolner. Golden Boy, starring Barbara Stanwyck, Adolphe Menjou and William Holden, was the first feature projected on the 30-by-40-foot screen at the center of parking spaces, which were laid out in concentric rings and designed to accommodate up to 500 automobiles. Inviting family audiences to “Enjoy Cool Lake Breezes and See a Swell Movie in the Comfort of Your Car,” the drive-in offered two shows nightly. Admission was 10 cents for children and 26 cents for adults. The Drive-In Theatre sat on prime lakefront real estate the Orleans Levee Board wished to develop. In the early 1950s, in order to create one new upscale residential subdivision, developers not only razed the city’s first drive-in theater but demolished the adjacent Navy and Veterans Administration hospitals, both of them new and having a combined capacity of 1,100 beds. The history of lakeshore reclamation and development is, indeed, interesting. My Acadian ancestor, Francois Louis Gaudet (born 1727), and his family arrived in New Orleans from Nantes, France, on the La Caroline, a Brig, on Mon., Dec. 12, 1785, after 54 days at sea. The trip was hard. Many died and were susceptible to smallpox. The Spanish government’s second in command, Navarro, built separate men’s and women’s dormitories in Algiers where they recuperated and became seasoned to the climate and country for a month before moving on to Bayou Lafourche. I have never been able to locate these dormitories in Algiers. I wonder if Poydras has seen these dormitories on his many flights over Algiers and would share this information with me and our many Acadian descendants. Although it’s an established fact that some Acadians were housed in Algiers prior to heading off to settle along Bayou Lafourche, I’m unaware that anyone has established the exact location of the dormitories where the Acadians stayed. The original buildings were, no doubt, razed long ago, but no historic marker marks the site. Until Poydras perfects time travel or some hitherto unknown document emerges from the French National Archives, showing or describing the exact spot where the dormitories were located, the precise location may remain lost to posterity. Here is a chance to eat, drink and listen to music, and have your curiosity satiated all at once. Send Julia a question. If we use it, you’ll be eligible for a monthly drawing for one of two Jazz Brunch gift certificates for two at The Court of Two Sisters in the Vieux Carré. To take part, send your question to: Julia Street, c/o New Orleans Magazine, 110 Veterans Blvd., Suite 123, Metairie, LA 70005 or email: Errol@MyNewOrleans.com. This month’s winners are: David Criddle, Gainsville, Fla.; and Dr. David Friedman, Potomac, Md.